Right: Ethan Ulanow carries a Torah he donated to Beth Israel in Metairie, La., at the congregation's new building dedication in August. The Torah was acquired from Rabbi Menachem Youlus. Two Torahs that were sold by Rabbi Menachem Youlus (see main story) and are in Louisiana congregations came with fanciful stories that ultimately proved to be false, but the bottom line in both cases is that the scrolls are still meaningful no matter where they came from. In the case of a Torah presented to Beth Israel in Metairie, the mitzvah is the donation, not the Youlus story. The congregation had lost its Torahs in the flood following Hurricane Katrina in 2005. Ethan Ulanow, who was studying for his October 2007 Bar Mitzvah in Potomac, Md., decided he could donate a Torah to the congregation. His Bar Mitzvah project was raising funds for the Torah, which cost roughly $20,000. He raised about $6,000, with his family providing the rest. According to Youlus, the 200-year-old scroll had been rescued from Ukraine, was hidden during the Holocaust and wound up in a monastery. There was an additional family connection in that three sets of Ulanow’s great-grandparents were from Ukraine. The Ulanows visited Beth Israel in January 2008 for the Torah’s dedication. 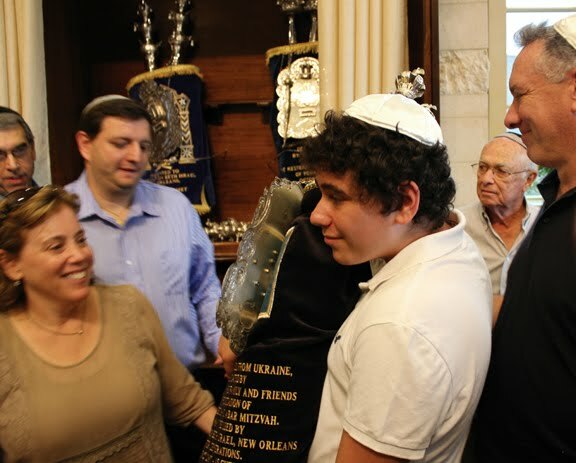 Ultimately, five Torahs were donated to the Metairie congregation from across the country. When Youlus’ fraud was uncovered, Beth Israel Rabbi Uri Topolosky and the Ulanows were asked for information about their acquisition of the Torah from Youlus. Topolosky agreed. “We are thrilled that it was a gift from (Ulanow) and that is how we remember the Torah,” he said, noting that even before the fraud was revealed, the Ukraine history was just a sidebar. They have no interest in finding out the Torah’s real origins — but they did use a white High Holy Days Torah cover that did not have the logo, and now rotate some other year-round covers that were rescued following Katrina. Across the state, Rabbi Foster Kawaler had received a call in May 2006 from Youlus, who told Kawaler he thought he’d located the Kawaler family Torah from the long-defunct congregation in Nadworna, Ukraine. Right: The Kawaler Family Torah dedication in Shreveport, June 2006. Everything checked out, including the unusual presence of a Sephardic-style Torah from northern Italy in Ukraine, which corroborated a family “legend” about being in northern Italy. Youlus described how four Israeli girls, traveling in Ukraine in 2004, were invited to see a Judaica collection in a monastery. When Youlus saw pictures from the girls, he flew to Ukraine to purchase and smuggle out three Torahs. 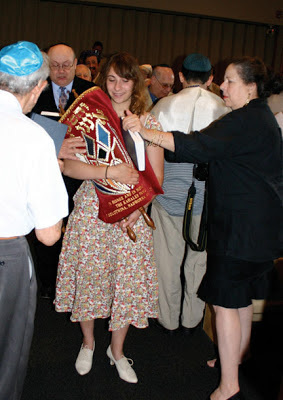 The Torah was dedicated at Kawaler’s congregation, Agudath Achim in Shreveport, in June 2006, with three generations of Kawalers receiving aliyot. When news came out about the investigation into Youlus, Kawaler was surprised, but said the scroll had been examined and it still checked out. Having known Youlus for four decades, “we would all be very disappointed if the rest of the story turns out to be untrue” about the Torah’s origins. Then he had a certified scribe in Dallas examine the scroll and concluded that “we were also taken in” by Youlus. “It was a masterful con,” said Kawaler. The physical characteristics of the Torah date it as no more than 50 years old, and it is likely the first Torah done by a new Chabad scribe in New York or Chicago, as the script improves as the scroll goes on. For the back story, he figures that Youlus pieced together parts of the Kawaler family history from what Kawaler had posted on the JewishGen genealogy website. “As a result he had information that I never gave him, and it came off sounding like someone was really over there with it in Europe,” he said. During the legal proceedings, Youlus contacted Kawaler to have him write a character reference letter to the judge. Kawaler declined.